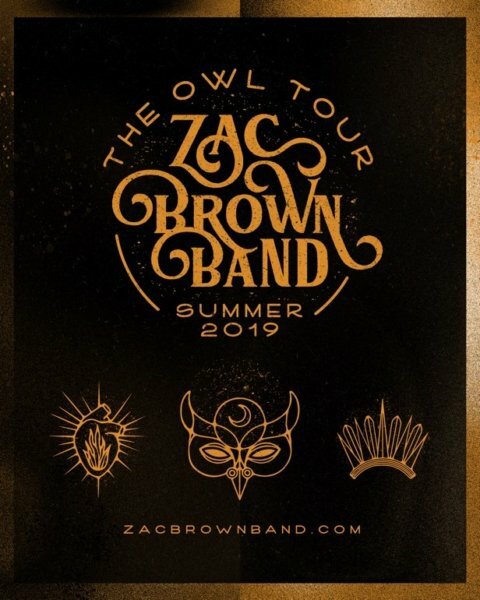 The Zac Brown Band just announced the dates of their “The Owl Tour” which will take place this summer. The band’s upcoming tour will stop in cities including Milwaukee, Des Moines, Denver, Boston, and Jacksonville. Kicking off in Indianapolis on May 25th, “The Owl Tour” will wrap up on October 26th in Dallas at The Dos Equis Pavilion. Country soul rock Band Lukas Nelson & Promise of the Real will join Zac Brown Band on the road on select dates. Caroline Jones will appear as a special guest artist during a few stops on the tour. Tickets go on sale to the general public beginning February 8th. Fans (members of the Zamily) will be able to participate in the presale on Tuesday, February 5th at 11am local time. For tickets or more info, visit ZacBrownBand.com.